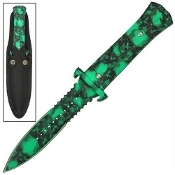 Green Zombie Skull Dual Edged Boot Knife Survival Hunting Dagger - Well-made with a strong and sturdy feel in the hand, a shrouded Zombie skull head pattern cloaked in an eerie haze across the entire dagger makes this the perfect weapon for a good Zombie hunt! Razor sharp with a silver lining and piercing dagger point tip, serrated segments on both sides of the double-edged blade makes the bayonet blade of the dagger useful for cutting rope and other tough materials. Textured to provide a solid grip in hand, the aluminum handle has a unique design with steel bolsters and bolster lining providing strength and support for rugged everyday use. The sturdy nylon sheath attaches to the belt/boot with a metal clip and holds the knife securely in place.